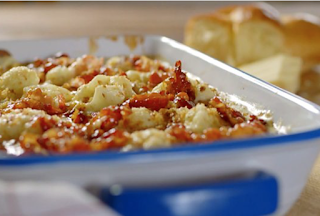 James Martin’s take on cauliflower cheese with maple syrup pancetta, from BBC Home Comforts, prepared in less than 30 mins and cooked in 10 to 30 minutes. Preheat the grill to its highest setting. Bring a large pan of salted water to the boil, then cook the cauliflower florets for 5-6 minutes, or until tender. Drain well and refresh in a large bowl of iced water. Melt half of the butter in a large saucepan. When melted, whisk in the flour to form a smooth paste. Continue to cook the paste for 1-2 minutes, whisking continuously. Gradually add the milk to the paste, whisking after each addition until smooth. When all of the milk has been added to the sauce, stir in the mustard and half of the grated cheese until smooth. Season, to taste, with salt and freshly ground black pepper. Drain the cooled cauliflower florets and transfer to an ovenproof dish. Pour over the cheese sauce, then sprinkle over the remaining grated cheese. Place the dish under the grill for 4-5 minutes, or until the cheese is golden-brown and bubbling. Meanwhile, melt the remaining butter in a frying pan over a medium heat. Add the brioche crumbs and fry until golden-brown and crisp, stirring well. Transfer to a bowl. Wipe the frying pan with kitchen roll. Add the pancetta and dry-fry until crisp and golden-brown. Drizzle over the maple syrup and stir until it coats all of the pancetta. To serve, sprinkle the breadcrumbs over the cauliflower cheese. Lay the rashers of maple syrup pancetta on top. Spoon onto plates.